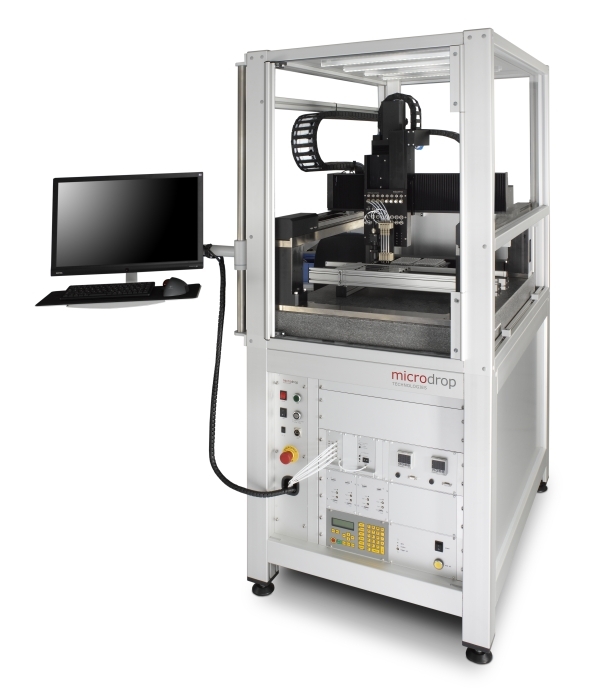 The Autodrop Compact System is a versatile tool for inkjet printing and material deposition. In combination with microdrop dispenser heads or pipettes the Autodrop Compact enables an easy start for using inkjet technology in numerous fields. The optional Graphics Design Editior allows the operator define own free designed pattern like curves and lines. Vector based graphic files (dxf-format) are importable. The design of this tabletop unit provide the integration of different substrates on the platform. The Printing System Autodrop Compact is available to control up to two dispenser heads or pipettes. The generous travel range of 210 mm x 210 mm x 110 mm (x-, y-, z-axis) makes the Printing System Autodrop Compact an ideal medium for R&D purposes and small batch production. The Professional Positioning System AD-P-8000 is designed for high accuracy in the μm-range. Vibration damping is achieved by using granite components for the base plate as well as for the bridge carrying the z-axis. The substrate is placed on the x-y-table and is moved relative to the dispenser heads, while the z-axis which moves the dispenser heads up and down is stable. This design minimizes the moved masses and improves positioning accuracy considerably. It is possible to move and control up to 8 dispenser heads or pipettes in parallel. Dispensing can be done in “start-stop”-mode or in-flight, i.e. while the head is moving. Aiming accuracy then differs ± 5 µm respective ±10 μm each single axis. The Autodrop Professional Positioning System contains all of the electronic control elements for the positioning unit and the dispensers. 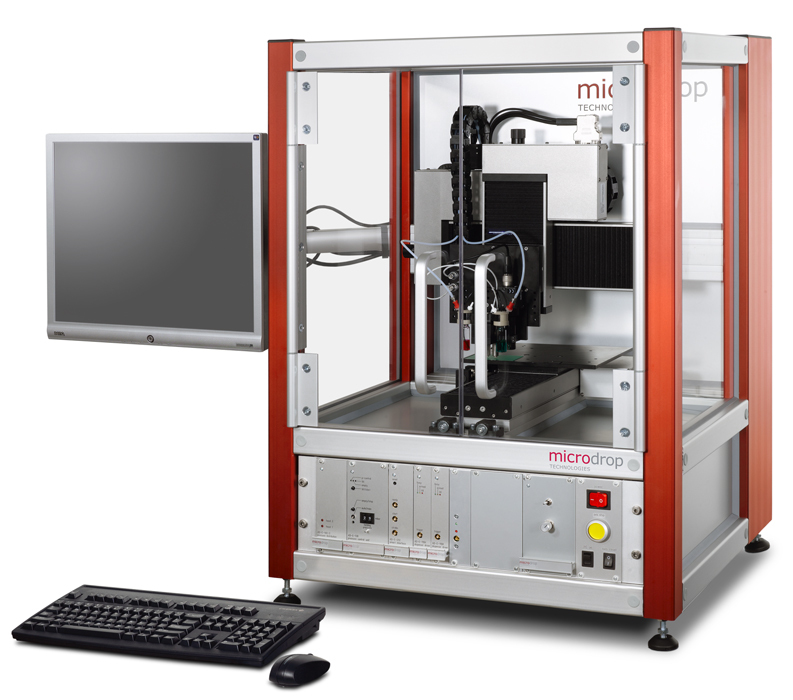 Autodrop Gantry System is a new device for inkjet printing and material deposition. 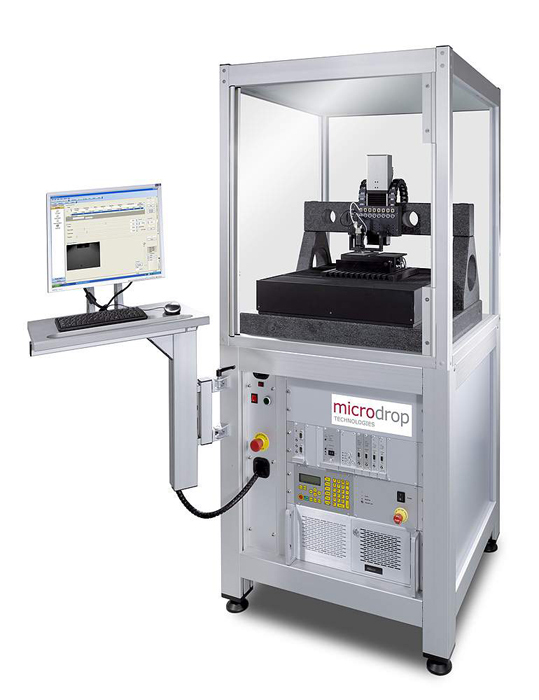 microdrop Technologies makes a higher degree of automated production processes accessible to their customers. The opportunity to integrate different microdrop dispenser variations like dispenser heads, pipettes and valves in combination with placing larger substrates or multiple microtiter plates makes the Autodrop Gantry System an improvement in the range of existing handling systems. Furthermore the option to adapt industrial feeding systems is still given. Autodrop Gantry System can be driven with up to eight mircrodrop dispenser heads, pipettes or dispensing valves. Large size printable area of 360 mm x 600 mm x 100 mm makes the Autodrop Gantry System to an ideal platform for inline-production. The substrate will be fixed while the dispenser units are movable.